‘Release Bertha Hernandez! 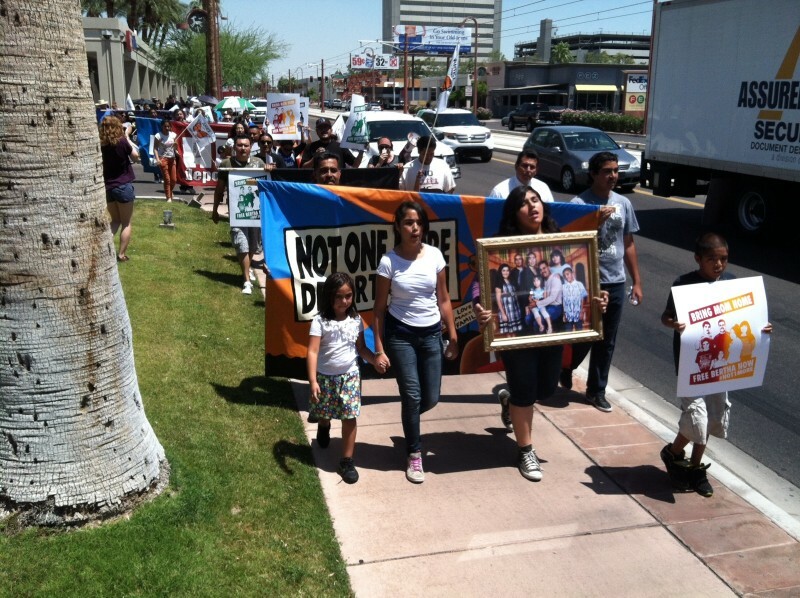 Stop the deportations!’ - Phoenix, AZ immigrant rights protest | Fight Back! Carlos Garcia of Puente speaks out against deportations in Phoenix, Arizona. 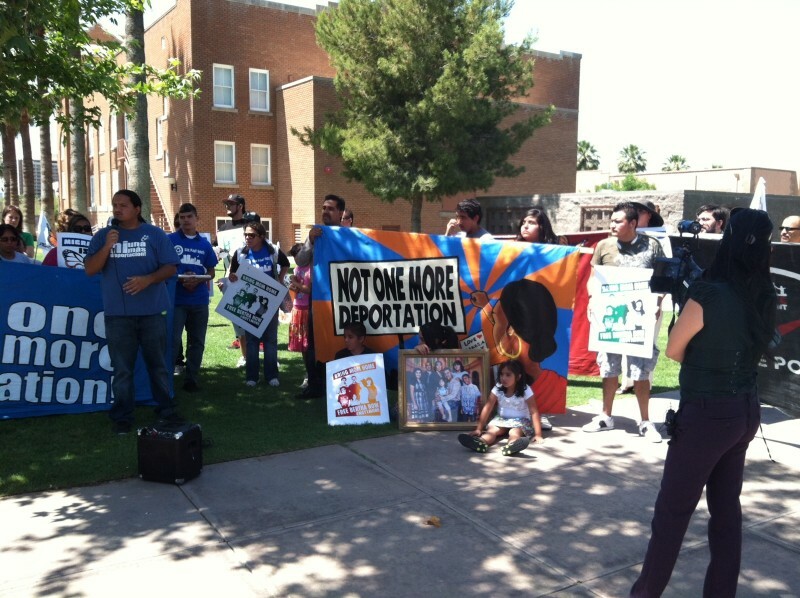 Phoenix, AZ – Thunderous voices of more than 120 people echoed through Phoenix on May 29 as protesters marched to the Immigration and Customs Enforcement (ICE) office, demanding the release of Bertha Hernandez and an end to deportations of undocumented immigrants. Students, counselors and teachers from Carl Hayden High School joined immigrant rights activists in the streets to protest the detention of Hernandez and other immigrants. ICE agents stopped Hernandez, a mother of five, at the Arizona-California border in November 2012. Though Hernandez lived in the U.S. for more than 16 years – raising five children, all whom are U.S. citizens – ICE took her into custody and placed her in Eloy Detention Center. The for-profit Corrections Corporation of America (CCA) runs Eloy. Hernandez has no criminal record. She immigrated to the U.S. from El Salvador seeking political asylum. She currently faces deportation, which will effectively break up her long-established family. Puente linked up with the Hernandez family to organize the rally, demanding Hernandez’s release from Eloy Detention Center and an end to the deportations. Hernandez’s case drew widespread community support from Chicanos, Central Americans and Mexicans in Maricopa County. Importantly for students and parents, Phoenix Union High School District Superintendent Kent P. Scribner and Carl Hayden High School approved of the protest organized by their students and the children of Bertha Hernandez. The rally began mid-morning in Steele Indian School Park, where protesters gathered to hear about Hernandez’s case. Speakers outlined the day’s plan and then protesters marched off to the ICE office in Phoenix to voice their demands directly to the officials responsible for Hernandez’s detention. Chanting “No more deportations!”, protesters congregated outside the building to hear testimony and speeches from Hernandez’s family and others who face racist repression. ICE officials refused to meet with the protesters regarding Hernandez’s case. Since the 2010 passage of Arizona’s SB 1070, which allows law enforcement to practice blatant racial profiling, Arizona remains a major battleground in the struggle for immigrant rights. The notorious Maricopa County Sheriff Joe Arpaio, facing a recall campaign, was found guilty of racial profiling by a U.S. Federal District Judge on May 24. Arpaio’s abusive and racist reputation as the most anti-immigrant sheriff in the U.S. leads to the detention and deportation of people like Hernandez. However, there is a strong and growing fightback movement in Arizona and nationally, aiming to defeat Arpaio, ICE and deportations. All over the U.S. this week, immigrant rights activists raised the demand, “Stop the deportations! Legalization for all!” by taking direct action. “Cases like Hernandez’s highlight the need for a truly comprehensive immigration reform that provides legalization for all undocumented people,” said Soto. Puente and other immigrant rights groups plan for further action to stop the deportation of Bertha Hernandez. On June 14, Puente and Hernandez’s family will attend Sheriff Arpaio’s hearing on the federal court ruling and demand his immediate resignation.